Quality Green, LLC began business back in the late 1970's dedicated to giving our customers the most personal and professional service available. We are a small family owned and operated business currently training the third generation of Klegstads to provide expert lawn care services for many years to come. 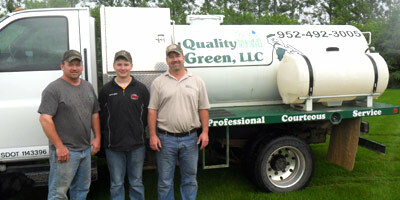 Quality Green, LLC is a Family Owned & Operated business that has provided weed control and lawn services in Jordan, MN since 1979. 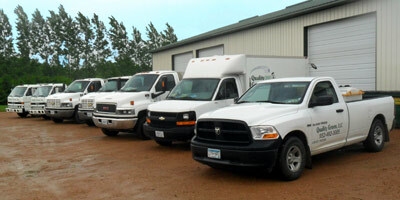 We focus on the Twin Cities south metro and rural south & west areas. Our goal is to make your lawn the greenest, weed free lawn in the neighborhood. With our custom built fleet of trucks and expert personnel, we can assure you a totally uniform weed control treatment application or a fast and efficient irrigation system installation or service. Materials used are selected from federally registered substances and applied by professionally trained personnel. Quality Green, LLC maintains a fleet of lawn care equipment for weed control, irrigation system installation and maintenance and more. Our primary concerns are for the safety of our customers and our environment while the result is a lush and green lawn that will make your neighbors green with envy.